If you are looking for some ideas on how to plan the timeline for your Wedding Reception, then below is a Sample Timeline that works for a 4 Hour Reception, about the norm when a Full Sit-down Meal is served. 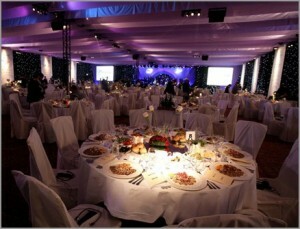 However, should you be having a Buffet Style Wedding, then the average Reception time is 3 Hours. 0-30 Minutes – The Photographer will be busy taking Pictures of the Wedding Party and Wedding Guests begin arriving at the Wedding Reception location. Drinks should be available, with background Music playing, as the Guests start to Mingle and Enjoy the Wedding Reception. 30-90 Minutes – Your Guests should be invited to sign the Wedding Guest Book and be shown to their seats, as per the Seating Chart. 60-120 Minutes – Guests will finish being seated for the Dinner or the Buffet is opened. As is customary, the Wedding Party is served their meal first. In the case of a Buffet, again, the Wedding Party goes through the Buffet line first. Wine and Champagne should be served and the Wedding Toasts may begin, traditionally beginning with the Best Man. 120-180 Minutes – The first Dance begins followed by the Cutting of the Cake. If food courses are being served, they should be winding down by now. Other Traditional Dances then follow, such as the Father/Daughter and Mother/Son dances. 180-240 Minutes – During the final hour of the Wedding Reception, the meal is wound down and the Bouquet is Tossed along with the Garter. The Bride and Groom then prepare to leave and are sent off to their Honeymoon! 240- 270 Minutes – The Wedding Reception wines down with the Parents of the Bride and the Groom seeing Guests off before the reception ends formally.